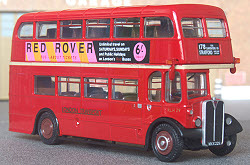 The London RLH casting was announced at the 2006 Showbus Rally with the first fully finished examples making their public debut at the same event one year later. The first release occured in January 2008. EFE have produced a number of London Transport models in both red & green livery and to date just one in another operators livery.